The insulation lorry arrived. The contains two generators to drive the machine, built into the truck, which fluffs up the Warmcel 500 and then blows it along large bore flexible pipes into the house. A disc of plasterboard is cut out, starting with the rafters, and Warmcel 500 (re-cycled, fire-proofed newspaper) is blown in filling the cavities formed by the I-beams between the external air-tight cladding and the internal plasterboard. Warmcel will fill all the wall cavities – both external and internal walls. It’s a fairly dusty job – and quite noisy outside with the generators running. It’s taken 7 days. 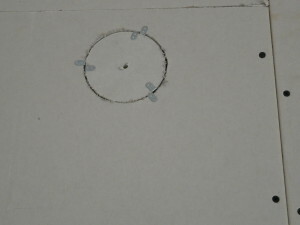 The circles are put back in afterwards with plasterboard clips and then, like the other plasterboard joints, covered with plasterer’s scrim. The plasterboard has been fastened with rather more screws than usual because of the pressure exerted by the Warmcel. The tacking and plastering is taking longer than expected – mainly because of the amount of effort brought to the job – started with 2 men, now only one. We’d asked that the kitchen and utility room have their ceilings plastered first so that they can be painted ahead of the rest of the plastering so that we can be confident that the date agreed with the kitchen fitters can be met. If we have to ask them to postpone then this date will go back by several weeks. As we’re doing the decorating, we’re able to do some of this over the weekend as it’s too dusty to paint while the insulators are at work. But for the rest of the house, there’s pressure on to finish off the tacking to keep ahead of the insulating gang. Hi David I have at last found time to look at your blog. Far too techinal for me. I was hoping for some pictures!